Stephen F. Austin State University's James I. Perkins College of Education recently selected recipients for the college's Teaching Excellence Awards. Pictured from left to right, Department of Kinesiology and Health Science representatives Sandy Miller, lecturer; Dr. Jay Thornton, chair; and Dr. Todd Whitehead, associate professor; Department of Secondary Education and Educational Leadership: Dr. Scott Bailey, associate professor; Dr. Linda Black, professor; and Alison Cope, visiting instructor; Department of Human Services: Dr. Kathy Sheriff, assistant professor; Deena Peterson, clinical instructor; and Dr. Robbie Steward, chair; Department of Elementary Education: Erica Dillard, instructor; Dr. Elizabeth Vaughan, chair; and Dr. Adam Akerson, assistant professor; School of Human Sciences: Dr. Darla O'Dwyer, associate professor; Dr. Lynda Martin, director; Todd Barrios, clinical instructor; and dean of the James I. Perkins College of Education Dr. Judy Abbott. NACOGDOCHES, Texas - Stephen F. Austin State University's James I. Perkins College of Education recently recognized several faculty members as the college's Teaching Excellence Award honorees. 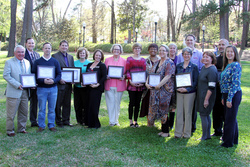 Annually, representatives are selected from academic units within each of SFA's six colleges to receive Teaching Excellence Awards. Then, each college selects one academic unit faculty member to represent his/her college at the university's annual Teaching Excellence Convocation. The Teaching Excellence Award recognizes outstanding full-time faculty members who demonstrate extensive knowledge of subject matter, quality lectures and assignments, enthusiasm for teaching, and interest in and availability to students. Commitment to continuous improvement and contribution to the quality of teaching at SFA by assisting and encouraging other faculty members also are considered. Honorees in the James I. Perkins College of Education include Dr. Adam Akerson, assistant professor in the Department of Elementary Education; Dr. Darla O'Dwyer, associate professor in the School of Human Sciences; Dr. Kathy Sheriff, assistant professor in the Department of Human Services; Dr. Todd Whitehead, associate professor in the Department of Kinesiology and Health Science; and Dr. Scott Bailey, associate professor in the Department of Secondary Education and Educational Leadership. Among the honorees, Bailey was selected to represent the Perkins College of Education at the university's Teaching Excellence Convocation, which will be held in April. "I'm honored to represent the college, my alma mater and the teaching profession," Bailey said. The college also recognized Faculty Senate Teaching Excellence honorees for non-tenure track faculty members. Honorees include Erica Dillard, instructor in the Department of Elementary Education; Todd Barrios, clinical instructor in the School of Human Sciences; Deena Petersen, clinical instructor in the Department of Human Services; Sandy Miller, lecturer in the Department of Kinesiology and Health Science; and Alison Cope, visiting instructor in the Department of Secondary Education and Educational Leadership.